At the outbreak of the Second World War the band was dismembered because members of the band enlisted in the Armed Forces. 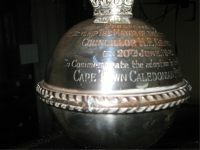 Once peace had been declared the Pipe Band was reformed 1946.
to the band to commemorate the City’s official adoption of the Cape Town Caledonian Pipe Band. 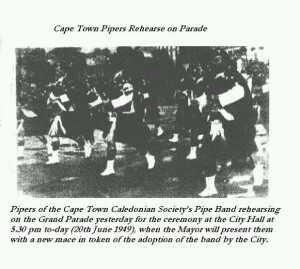 The fact the Pipe Band was in serious need of uniforms at the time, a grant was received from the City of Cape Town to aid the band’s needs. Photos from the City of Cape Town adoption ceremony, 20th June 1949. In 1980, Ted Hey, who served as Pipe Sgt for the Cape Town Highlanders during World War II bought all the uniforms from the defunct Port Elizabeth City Pipe Band who wore the Ancient MacDonald tartan. He then recruited a few ‘retired’ members of the Cape Town Caledonian Pipe Band and some youngsters he had tutored to form the Cape Town Piping Society Pipe Band. 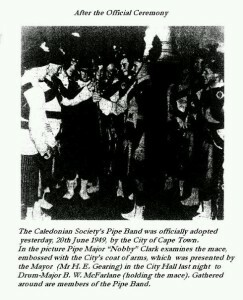 During 1981 negotiations to amalgamate both bands resulted in the Cape Town Caledonian Pipe Band becoming the Cape Town Piping Society Pipe Band – although the Callies band had insisted that some part of their name be retained. However, this never materialized. in 1982 the new Cape Town Piping Society Pipe Band resulted, wearing the Ancient MacDonald tartan. It was in 1989 that the band changed from wearing Ceremonial dress to the more comfortable Argyle uniform, which is now the accepted dress of all civilian pipe bands world wide. 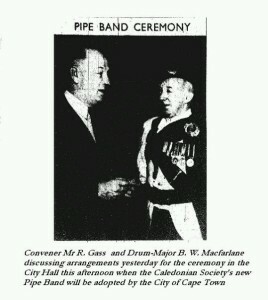 In 2000, the band’s name changed back to the Cape Town Caledonian Pipe Band. This was an unanimous decision agreed upon by all the band members at the band’s AGM, as the pipe band began orientating itself towards competitions. 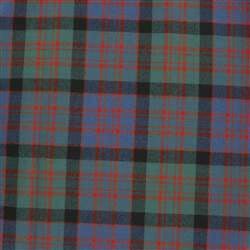 The band still wears the Ancient MacDonald tartan today.